Confused about the difference between almond flour, almond meal, and blanched almond flour? Want info on the best products to use? This article is for you! 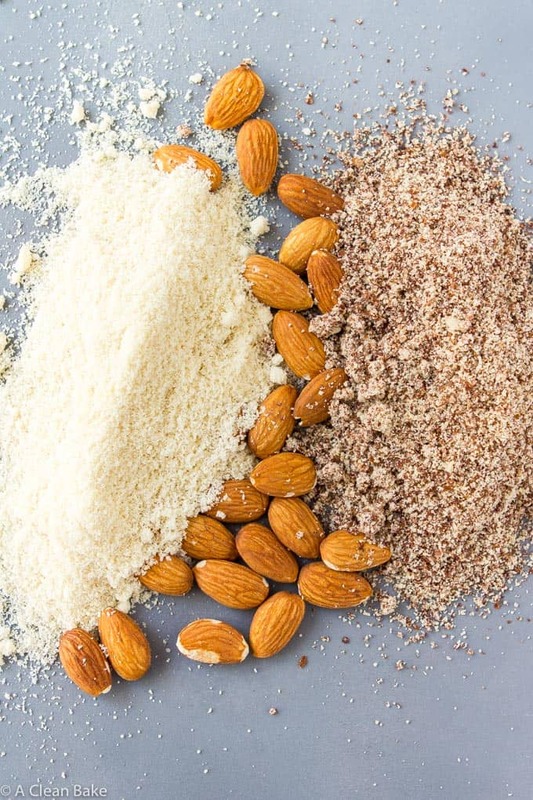 Read on to learn everything you ever wanted to know (and more) about almond flour. 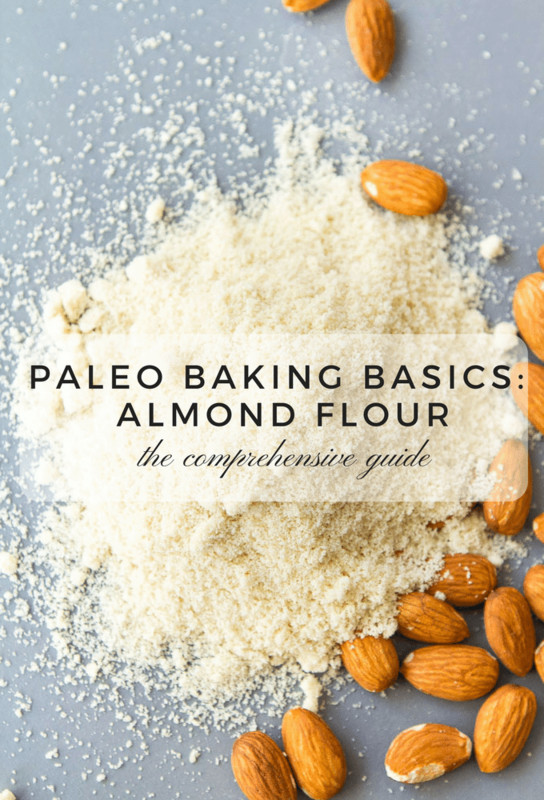 Welcome to Part 1 of Paleo Baking Basics. I’ve getting lots of questions lately about the “blanched” in blanched almond flour. No way. I’d never do that to you. I guess you could, but if you’re aching to grind nuts into something, try a nut or seed butter instead! Today, I want to answer all of your questions about this ingredient, including those you haven’t asked yet (so feel free to leave me comments below if there is something that I haven’t addressed). This is going to be a long post, but hopefully an informative one. So, buckle up. And hopefully you learn something new today! First things first: What is blanched almond flour? It is blanched almonds that are ground finely enough to resemble flour. Ok, but what are blanched almonds? Blanching is the process of scalding the almonds so that they can be peeled. Once they are peeled, they become white (well, more of an off-white or cream), which is another interpretation of the term “to blanch” (to whiten), and I’m not sure which one is primary, or if that’s a coincidence, or what. Anyway, in this case, as I said, blanching means removing the rough skin of the nut to reveal the smoother, more mildly flavored meat inside. Blanching almonds is easy to do: you boil the almonds for a short period of time – about a minute – to loosen the skins enough to remove. The cooking time is not long enough to soften the almonds; it is just enough to separate the skins from the meat. After boiling, the almonds are immediately transferred to a bowl of ice water to stop the cooking process (remember: you don’t want to soften the meat! ), and then the skins are removed and discarded. From there, you can dry the almonds and and ground them into flour. Wait, I thought you said I didn’t have to make my own flour! Yeah, I meant more “one can” than “you can”. YOU should just buy the flour. It’s so much easier. Where can I find blanched almond flour? Most grocery stores and health food stores carry blanched almond flour these days. You can also buy the flour online, through the manufacturer’s website, or through sites like Amazon or Thrive Market. I like to order it online because you don’t have to lug it home. Almonds are heavy and almond flour typically comes in 1-, 3-, and 5-lb bags! Sign up for Thrive Market here to get 25% off of your first order. Sign up for Amazon Prime here to get the first 30 days of Prime free! You’re really looking to distinguish between the fineness of the grind, and whether it’s blanched or not. These names (sometimes) provide clues, but you’re better off looking at the flour itself. So, how do I know if it’s blanched? Blanched almond flour will not always be labeled blanched. It is sometimes labeled just almond flour or almond meal (I’ll get to those distinctions in a minute). There is one way to know if it is blanched: color. Blanched almond flour will appear as a uniform, cream color. That’s it. If it’s unblanched (sometimes called raw) almond flour, it will be a mixture of brown and cream. The brown is the ground up almond skins – which, we already know, means it can’t be blanched! 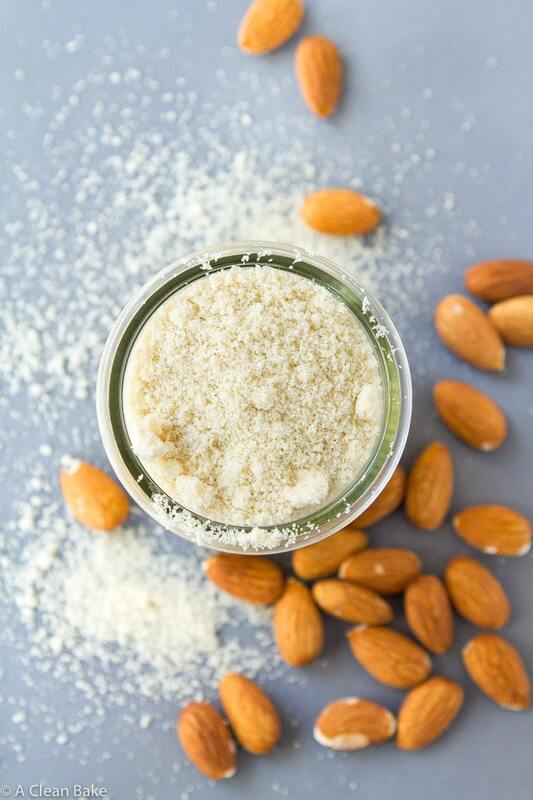 Raw almond flour has a place in cooking, especially when you actually want that slightly nutty flavor that the skin of the almond brings to the table. I like to use raw almond flour as a binder in dishes like casseroles and meatballs. 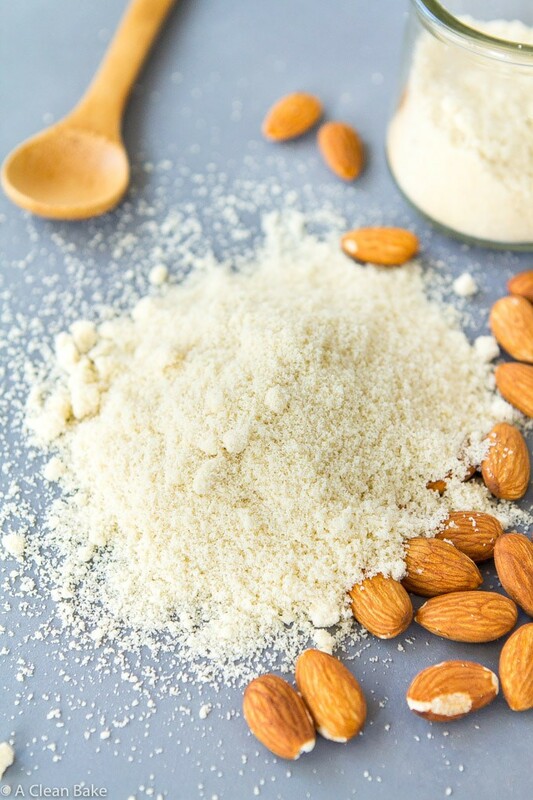 The other characteristic of almond flour that you need to think about when selecting a product to bake with is the consistency. Simply put: the finer the grind, the more the final product will resemble something you’d make with grain flour. A courser ground flour will result in a courser and less cohesive texture. Makes sense, right? You can usually predict which products will have a courser grind by the way they are described on the package. Typically, if it is labeled almond meal, it means it will be more coarsely ground. Almond meal is usually not ideal for baking. If you’re not sure which almond flour to use, choose the one that looks as close to the consistency of grain flour as possible. That typically means the finer the grind, the better. Which blanched almond flour brands can I trust? I always recommend Honeyville brand, because that’s what is in my kitchen (this is not sponsored, by the way). Why? I started using Honeyville blanched almond flour shortly after I started baking with almond flour, and that is the brand I have used ever since. It has always worked really well for me, so I have never had a reason to switch to another brand. I like it because it is very finely ground, which results in the best texture outcomes. What I’m trying (too hard) to say (in an unnecessarily technical way) is that Honeyville almond flour is super fine, so it acts as close to grain flours as possible. It is also available in large bags, so if you bake a lot, it is much more cost effective. Pros: The flour brand performs well, and is easiest to find. Most grocery stores, Whole Foods, and natural foods stores carry 1-lb bags of this brand, it is available online, and I believe many WalMarts and Targets carry it, too. Cons: Larger volumes are harder to find. Amazon just started carrying a 3-lb bag, and they also carry a 4-pack of the typical 1-lb bags. Note: BRM brand almond flour comes in two varieties. The first is called “almond meal/flour” and the second is called “super-fine almond flour“. Pros: Accessable both online and in retail stores. I’ve gotten it at WalMart, and I recently started seeing it pop up on Amazon, too. It’s finely ground, and performs well. Cons: Initially, I thought it was a great deal, but it turns out the price difference isn’t actually that great. It’s not more expensive than other options, though. But for an “off” brand (which I think it is, or at least a newer, less tested brand), I expected there to be some price advantage. Oh, well. There are other brands out there, but I don’t know much about them, so I can’t tell you if they’ll work well! Do you have any experience with other brands? Let me know in the comments! Almonds are nutritional powerhouses, containing vitamins and minerals (they are great sources of vitamin E and magnesium, for example), healthy fat, and protein. We know; that’s why we prefer their flour in our baked treats! So obviously, it’s important to understand the impact on blanching when it comes to altering the nutritional profile of almonds. Long story short: there is a difference, but it isn’t much to worry about. Blanching is a cooking process that is designed to heat food for the minimum amount of time possible to maintain as many nutrients as possible. Transferring the food from the boiling water to a cold water bath is an essential part of blanching, because it stops the cooking process instantaneously, ensuring that all of the remaining nutrients are locked in to the food. That’s why, for example, you blanch green beans when you want to lightly cook them but maintain their vibrant green color (and the nutrients that go with it). So it’s still a very good choice, nutritionally speaking, even when blanched! Short term storage: Store your flour in an airtight container or zip top bag in the fridge. Many bags of flour come with a built in zip top but it never works. Little grains of flour get stuck in the channel and prevent it from sealing. So I always roll the top over several times and use a binder clip or two to secure it shut. If not stored properly, the flour can absorb aromas of things around it, or the oils in the flour can go rancid. Long term storage: If you bought a large bag, but don’t plan to use it quickly (within a month or two), I suggest dividing the bag into 3-4 portions and store them in airtight containers or zip top bags in the freezer. Pull each out as you need it and store it in the fridge. Bring it back to room temperature before using. Use: While I will admit to skipping this step when I’m in a hurry, it is best to sift the almond flour to remove the inevitable clumps before using. When measuring, make sure you’re spooning aerated (stirred or sifted) flour into the measuring cup and leveling it off with the back of a butter knife. Do not scoop it directly out of the bag into the measuring cup. “What can I substitute for the almond flour?” This is probably the number one question I get about almond flour in recipes. The short answer? Nothing. Sorry. The longer answer has to do with fat content. Fat matters. It is one of the key building blocks of a recipe, because it imparts moisture, and moisture means texture and cohesion. Without enough fat, a baked good tastes and feels crumbly, gummy, or flat. You know that “low fat” taste? You take out fat and it tastes like something is missing. Unlike grains, which contain almost no fat, almonds are fatty nuts (about 14-15g of fat per ounce, but it’s mostly heart-healthy monounsaturated fat! ), and grinding them into flour doesn’t change that. This information is pertinent because any recipe that has been designed to work with almonds (as flour) has taken their fat (moisture) content into consideration, and you can’t replace that with hazelnuts (17g fat per ounce) or brown rice flour (0.3g fat per ounce). See the trouble? So, while I’m always happy to accommodate your requests for replacements, in order to make your baking experience as easy as possible, unfortunately, I would not recommend replacing the almond flour with anything. That’s ok, though, because now you know how to select, buy, and use almond flour! And if you need some recipe suggestions, here is a huge list! Last but not least: The Giveaway! 1) Follow me (@nora_acleanbake) and Honeyville (@honeyvillegrain) on Instagram. If you don’t use Instagram, you can like us on Facebook instead (my page and Honeyville’s page). Please leave me a comment below 👇 letting me know what your Instagram (or Facebook account) name is. 2) Leave me a comment below telling me what you’ll make first if you win the bag of almond flour! Fine print: Contest is open to continental US residents ages 18+. Entries are valid from 7:00am central standard time on Tuesday, October 10, 2017 until 11:59pm central standard time on Sunday, October 15, 2017. Contest is not affiliated with or endorsed by Instagram or Facebook. I follow on instagram, @thehippiehut32 and I follow on facebook, Brenda Haines. I would love to make some macarons with the almond flour. I have never made or tried them, but have always wanted to. i would make paleo chocolate chip cookies! Congrats, Meghan – you are the winner! Can you email me your mailing information (nora@acleanbake.com) when you have a chance? Thanks! I’m going to make Gluten free brownies!! Yum! Almond flour never ceases to impress me with delicious baked goods! If I won I’d make some almond flour pancakes because my son has been begging me to make a batch! Would love to bake some banana bread! Following on Instagram @avosslm I love using almond flour to make my pizza crust. I liked your page and Honeyville’s page on Facebook. My Facebook account name is Isabella Rose. If I win the bag of almond flour, I would love to make your banana bread with pecans, dates and caramel glaze. Banana bread is one of my favorite foods to bake! I’ve modified my recipe over repeated testings, but I really want to make a version without all-purpose flour. Therefore, I think your recipe will be perfect! My fiance also loves banana bread and pecans! I haven’t seen him since July since we are in a long-distance relationship, but if I win the bag of almond flour, then I could make it for him the next time I see him. Thank you for providing me (and your other readers) with the opportunity to enter a giveway! I would make a gluten free dairy free citrus pistachio pound cake. I am so blessed to have your website as a choice to my Google search “gluten free paleo free recipes”. I am so thrilled to see all of the main course recipes as well as baking recipes (I absolutely love to bake and this was a great sadness to me with the need to begin a gluten and paleo-free way of eating but not anymore! Thanks to your amazing website). There is much to learn and I’m so thankful to learn it from you. I don’t know if I’m too late for the sweepstakes but I just Liked and Followed you and Honeyville on Facebook. My screen name is my own, Maria Rugolo. I also subscribed and signed up for the 30 Days of Healthy Dinners ebook. What more can I ask for. Thank you so very much. That is so wonderful to hear, Maria!! 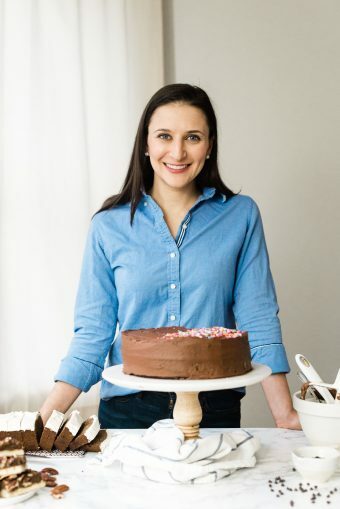 I’m thrilled that you found my site and that it will help you so much 🙂 Switching to gluten free and paleo cooking and baking can be hard, but I hope that my recipes will make the transition as easy as possible! oops, I forgot to add that I cannot wait to make your PALEO VANILLA LAYER CAKE WITH STRAWBERRY FROSTING. I’m a big fan of baking and a big fan of eating baked goods.